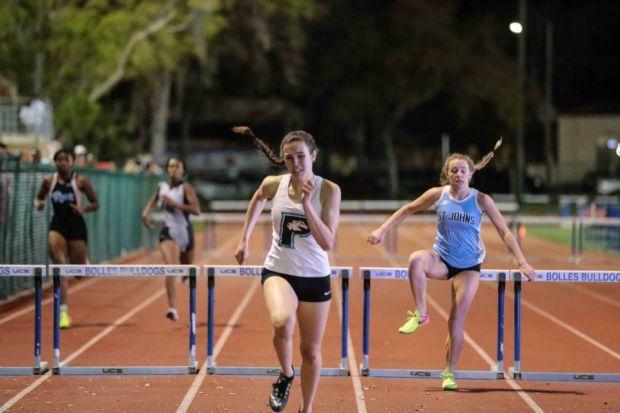 The Bolles Bulldog Classic, held Friday March 2nd at Bolles High School, was the scene of new National #1 times produced by some familiar names. Equally impressive, if not more so, were the results of a budding superstar from the western Panhandle. 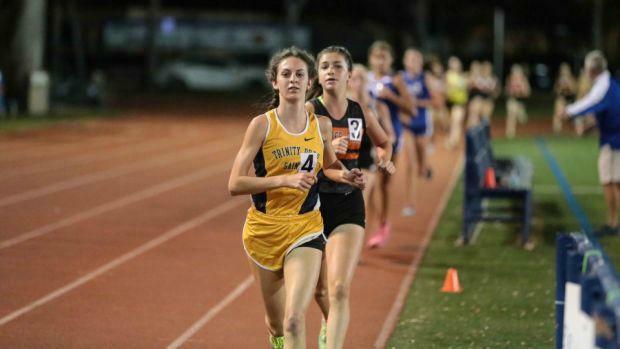 Bolles own Caitlin Collier raced away from the competition in both the girls 800m and 1600m. Her 4:47.47 in the 1600m is the new National #1 by 6 seconds to the U.S. #2 time of Newsome's Bailey Hertenstein (4:53.24), and U.S. #3's Alyssa Hendrix (4:53.51) of Riverview. Collier's 800m win in 2:10.58 would also be the U.S. #1, save for the fact she ran a faster time of 2:09.63 a week ago at the Flagler East Coast Classic. The boys 3200m race, though, was the most competitive and nationally significant event of the meet. Jacob McLeod of Trinity Christian School in Georgia, the National #2 to Chiles Michael Phillips in the 1600m, outdueled Charles Hicks of Bolles and Nathan Jubran of Bishop Kenny for the victory. McLeod's gutty win in the war of attrition resulted in a new U.S. #1 of 9:03.44. Hicks (9:04.56) was edged out by a little over a second, and Jubran (9:06.72) by only three. The end result was that McLead, Hicks and Jubran woke up Saturday morning holding the top three spots in the national rankings. Emerging star Anthony Bryan of South Walton High School, the U.S. #1 in the 2019 decathlon rankings, continues to separate himself from his decathlon competition via his steady rise up the individual event leaderboards. 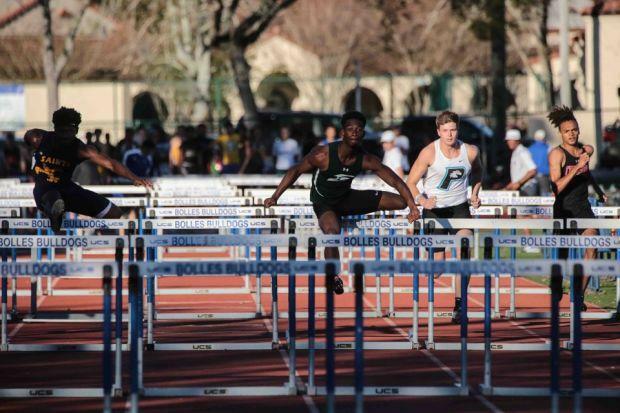 On Friday, Bryan's win of 14.42 in the 110m hurdles ranks him 1st in 2A, #2 in Florida and #3 nationally for the class of 2019. His 14'03.25 pole vault tied him for the top spot for Florida's 2019 class, and 2nd in 2A with Patrick Coyle of Bishop Kenny, who won the Bolles meet over Bryan in a tiebreaker. In addition, Bryan will be a threat to medal at state in the discus and the 300m hurdles. Rockledge High School took home the trophy on the girl's side. Sterling Jenkins showcased her versatility by winning the triple jump with an 11.51 effort, just edging out Samarah Hill (11.40m) of Trinity Prep. Jenkins also won the 100m hurdles and placed 6th in the 300m hurdles. Rockledge also received an outstanding performance from Justice Wade, who won the 200m dash in 25.63, and placed 4th in the 100m dash. 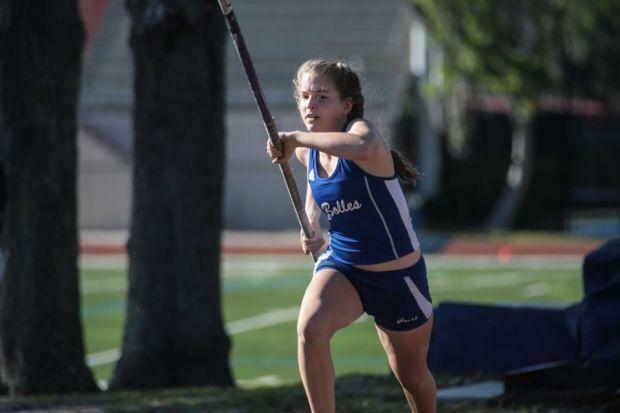 Bolles was 2nd in girls team scoring, with Collier's distance victories key. Also providing a win was Laine Roberts, currently #1 in Florida and #8 in U.S. pole vault rankings. Her 3.65 vault edged Florida #2 Elizabeth Nix of Winter Park and #5 Merileigh Camaret of South Walton who produced 3.60m and 3.30 results respectively. Bolles also took the win in the 4X800m relay with a 9:54.01. Other notable performances included those of Bishop Snyder's Samaj McGhee. She, Ptasha Bryan of South Walton, and Jade King of Rockledge all high jumped 1.55m, with McGhee winning the tiebreaker. She also earned a 2nd in the discus (30.04) behind Sydney Lake of Yulee High School's 34.22. McGhee also finished 3rd in the long jump (5.39) behind 2nd place Terriana Smith of Rockledge (5.49m) and 1st place winner Caroline Johnston of Episcopal who leaped 5.89m. Elizabeth Crosby of Providence easily took the 300m hurdles in 45.46. She also took 4th in the 100m hurdles, and anchored her 4X400m relay to 7th. Flagler's Summer Wells won the 400m dash, then anchored their winning 4X400m relay. Sophomore Audrey McAnally of Trinity Prep took the 3200m in 11:27.03, and ran 4th in the 1600m with a 5:10.50. The Bolles boys team finished 1st in team scoring with 87.5 points, beating out Sandalwood's 2nd place 70 points. Chase Rivera of Bolles won the 1600m run in a U.S. #4 time of 4:16.76. Their 2A #1 4X800m relay team also won 1st in 7:54.19, but only by less than a second ahead of Vanguard's 7:55.13, and 5 seconds clear of South Walton's school record setting time of 7:59.28. 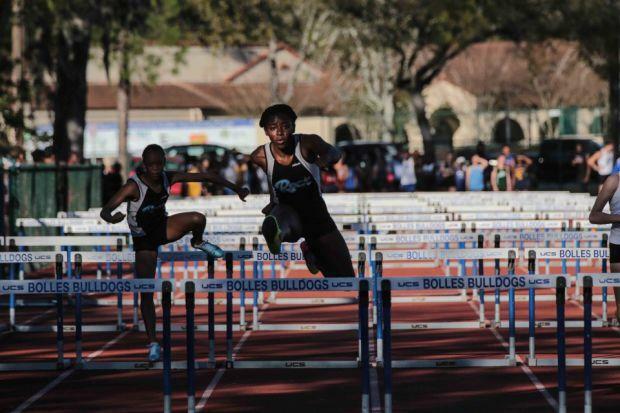 Sandalwood's points came mainly from Edwin Carter's winning time of 40.02 in the 300m hurdles, their victorious 4X400m relay team, and triple 1st place winner Andrew Motley, who swept the wheelchair events of shot put, 200m race and 800m race. Motley's shot put of 6.24m is now the U.S. #1 in that event. The 800m race was also an exciting duel, with the top 5 finishers all breaking the 2:00 barrier. Matanzas' Jacob Miley's 1:54.28 is now the new #1 Florida and #2 U.S. time. 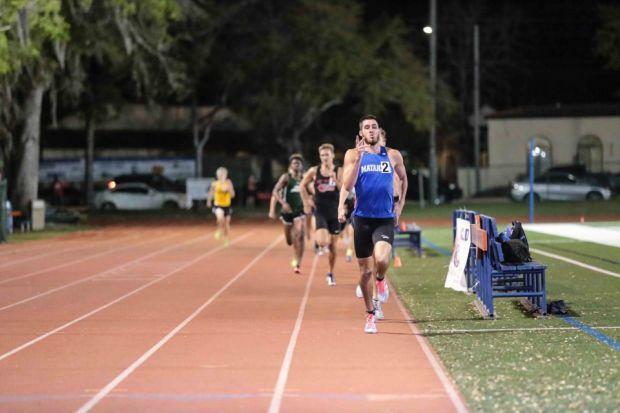 He edged out Vanguard's Alex Kay, whose 1:54.28 is now #3 in Florida and #5 in the U.S. The boys field events provided their own drama as well. In addition to the tiebreaker required to decide the contest in the pole vault between Patrick Coyle and Anthony Bryan, Nyem Bozeman of Trinity Christian won the high jump, also in a tiebreaker, over Terrance Young of Bucholz, with each clearing 1.90m. 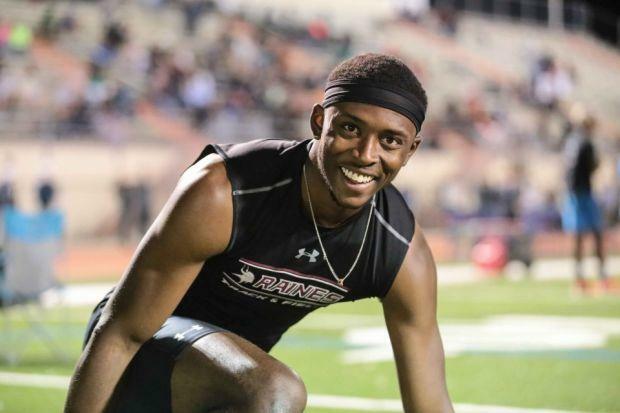 Jalen Chance of Bishop Snyder won double gold, finishing 1st in the long jump with a 6.62m result, along with a 13.73m effort in the triple jump which easily took that event. Marlon Brooks was a key contributor for Raines High School. He won the 200m dash in 21.75, the helped propel Raines to an elite finish for their signature victory of the day, clocking a 41.63 in the 4X100m relay. On the final event of the day Brooks also contributed to Raines 2nd place finish (3:29.92) in the 4X400m relay, where they were edged out by Sandalwood.